It is a bleak scene. Large expanses of barren land, reddish lifeless soil, logs from felled trees scattered across vast stretches of an otherwise empty land. This is what is left of the once lush sal forest for which the area was known. This is not all. 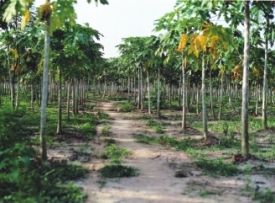 In place of the native sal trees are the neatly lined up tall, glistening eucalyptus and acacia trees along with healthy fresh papaya, banana and pineapple. Nobody seems bothered about the natural forest that has been wiped out from the sal forest zone and hill areas. A documentary film titled 'Bippono Bon' or 'Stolen Forest' produced by Society for Environment and Human Development (SEHD) and conceived and directed by environmental activist and journalist Philip Gain along with Junaid Halim, depicts the sorry state of the country's forestland. The 76-minute long film tells two sad stories - the first is about the destruction of the sal forest while the second portrays the wretched condition of the forests in Chittagong, Cox's Bazar and the Chittagong Hill Tracts (CHT) belt. Philip shows the present shocking conditions of the forests and how monoculture plantations have devastated the adivasi people's livelihood, culture and tradition. Modhupur sal forest, the third largest forest of Bangladesh, once home to countless species including medicinal plants, fruit trees, uncultivated vegetables, herbs, creepers, has been transformed into gardens of rubber and fuel-wood, banana, pineapple, and papaya. The towering garjan trees that once thrived with numerous other native species in the forests of CHT are fast becoming a rare sight and their places have now been taken over by exotic species like teak, acacia, eucalyptus and pine. Large expanses of the natural forests in the hilly areas have been destroyed for cultivation of pulpwood, in order to facilitate the supply of raw materials for the Karnafully Paper Mill. The government established two pulpwood divisions -- one in Bandarban and the other in Rangamati -- for the purpose. The pulpwood plantation of the forest department have forcefully occupied the land of the hill indigenous peoples who have had to abandon their jhum cultivation, a tradition that had been preserved for centuries. The deep wrinkles on her face cannot hold her tears as Brojendra Bormon of Agrakuri village tells her story. The forest department's woodlot cultivation in the Modhupur sal forest forced Bormon out of her house where she has been living for at least three generations. "Thirteen families have been evicted from Dargachhala and Fulbaria village, but the forest department people are telling us to leave this place too. Can you tell me where we will go?" Bormon asks. 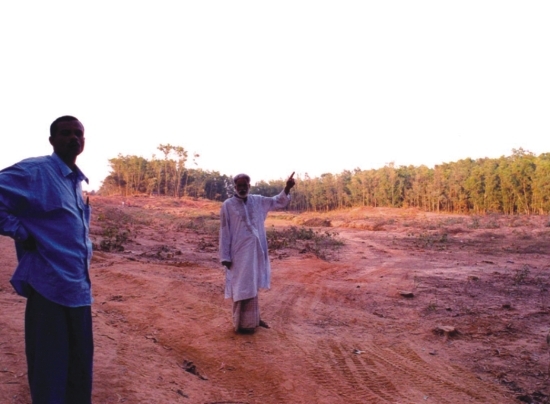 Garos and Mandis, two of the larger indigenous tribal groups, who have been living in the Modhupur sal forest for years have been irreparably affected. "Everything has been snatched from us, our land, our homes and means of our livelihood. We used to collect vegetables, fruits from the forest, now there is nothing left," Rahesh Dalbat, a member of Sholkuri union parishad says. It is not just eviction and being deprived of their natural rights these forest people have had to face. They have been forced to flee from village to village after false cases were pressed against them. Many have suffered police harassment while others are languishing in jail for protesting the forest department's activities. Over the last two and a half decades the forest landscape of the country has undergone massive change that were environmentally detrimental. The total forest area has shrunk to such an appalling proportion during this period that experts fear that if the destruction of forests continues at the same pace, Bangladesh might very well turn into a barren land in the next 10 to 15 years. The hills in the CHT are bare today, while the traditional sal forest is a distant memory. Philip Gain who has extensively visited these forest areas in the last two decades has closely witnessed how things have changed over the years. In the film, Gain attempts to capture the terrible state of the country's forestland and tries to show how things came to such an appalling state. Whether intentional or not the government's policy regarding forestry has always been threatening to the environment. More often than not, these policies are imposed by interested international monetary agencies that prescribe man-made planted forests by clearing away the natural forests. This has been disastrous for our forests. The mindless monoculture plantation of exotic and invasive species in the place of the native forests has wreaked havoc in two ways. Gain points out, "A large chunk of our natural forest has disappeared along with it its rich bio-diversity, causing immeasurable and perhaps permanent loss to our environment. 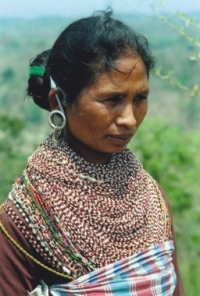 The loss of the indigenous forest has also devastated the life and livelihood of the adivasi people." The original sal forest spread across 1,20,000 hectres covering areas in Modhupur Garh, Dhaka, Rangpur, Dinajpur, Mymensingh and Rajshahi. According to the Forestry Master Plan completed in 1993 the sal forest in Tangail covered an area of 20,000 hectres in 1970. It shrunk to a piteous 1,000 hectres in the span of just 20 years. The biggest sal forest in Modhupur is now in a wretched condition. Once these forests were densely populated by trees, seventy percent of which was sal. Apart from sal, a myriad of other trees like karoi, joginichakra, chambal, kaika, sidha, amlaki, sajna, kals, sonalu, ajuli and gaogila etc used to cover the forest areas. On top of that there were medicinal plants like boshak, kalomegh, shatomul, sarnalota, sarpagandha etc. A large variety of animals like leopard, deer, bear and birds like peacock, pythons that once roamed the area of the Modhupur sal forest have also disappeared. Sal trees are extremely eco-friendly and its dead leaves, once mixed with the soil, increase the fertility. 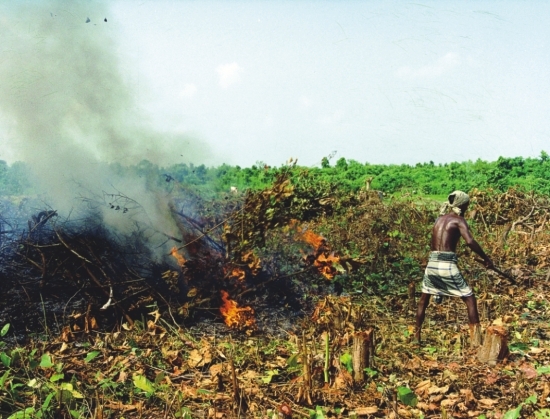 Traditionally, the fallen leaves are burnt by the adivasis and left to let the rain splash the ashes across the land. The ash-mixed soil provides nourishment to the sal trees and helps grow the new seeds. In the rainy season thousands of seeds are grown in one sal tree and fall in after they are ripe. When these seeds are planted they grow into sal trees. Sal trees produce strong wood and have a huge demand for construction purposes and are used in the foundations of houses in the village. They are also used in the kilns. Sal forests have also been the source of potatoes and wild fruits, one of the prime sources of food for the adivasi people. The adivasi people also collected the animal feed including grass as well as straw and other plants that grew in the sal forest for building their houses. But this centuries-old tradition is now a distant memory. The first round of assault on the sal forest came in 1986 in the form of rubber cultivation. Thousands of acres of sal forest were cleared off in no time, through felling of sal trees as well as every other variety of trees and plants that have been growing in the sal forest for hundreds of years. Then started another round of destruction of natural forest in the name of plantations. Invasive and exotic species, particularly eucalyptus and acacia were sown by the forestry department cutting away thousands of sal coppices. The government and its forestry department echoed the usual mantra of various international monetary agencies: "The existing non-productive and irregular species will be replaced by high yielding and productive foreign species, which will provide raw materials for paper mills and can be used as fuel wood," they argued. The sal forests were further denuded to give way for cultivating banana, papaya and pineapple, another state intervention that threatened the natural forests. After the eucalyptus or acacia trees that were sown as part of the new planting spree, were felled after ten years or so, these huge stretches of former forest land became completely barren. The rich and influential took this opportunity to use the public forestland to plant fruit trees. They turned large expanses of the former sal forests into banana or papaya orchards or other crop plantations. This was done completely illegally right under the nose of the forest department people who did not lift a finger to stop the encroachers. Such banana or pineapple cultivation in the forestland is wreaking havoc on the environment. Rampant use of hormones and insecticides for better yields is not only posing serious health hazards for the advasi people living there but are causing permanent damage to the soil. These chemicals also kill different varieties of insects that are beneficial to the soil and environment. The soil has taken on a yellowish hue from the overuse of these insecticides and experts fear that these have done serious damage to the upper layer of the soil and if it continues like this the soil there may lose their fertility completely after a few years. The CHT has also faced the onslought of indiscriminate destruction of its natural forests. Among the valuable species of trees that once grew in the forestland of the CHT area are jarul, gamar, garjan, chapalish, tun, karoi, civit, champa, shimul, chandul etc. all of them tall, mostly deciduous or semi-deciduous. These woods were evergreen with small trees and creepers growing in between the large trees. With some trees shedding their leaves in the summer and others in the winter, these forests would remain green throughout the year. That greenness is long gone, perhaps forever. It is not just the trees and hills that are treasures of the forestland in the CHT area. It also had a large variety of animals such as huge wild elephants, bisons, samburs, barking deer, leopards, Bengal tigers and panther. Many beautiful birds adorned these forests including the imperial pigeon, green pigeon, white winged wood-duck, moyna and bhimraj. Today sighting of any of these exotic birds would be a rare event, thanks to the absence of their natural habitat. Segun trees for their beauty and strength are perhaps the most coveted species we use for furniture. But, contrary to many people's belief, segun is not a local but a foreign species that was first imported during the British era. It was in 1872 when segun was first brought in from Burma and sowed in Sitapahar in Chittagong. The British left long ago but segun continued to be adored during the Pakistan regime as well as after the independence of Bangladesh. Segun, though expensive and attractive, is injurious to the local environment and soil. It causes huge soil erosion and no other trees grow underneath a segun tree, especially if segun trees are grown in the hilly areas. Huge chunks of soil erode from the hills where segun gardens have been cultivated, especially during the rainy season. It is the soil erosion due to the segun cultivation that gathers silt in the Kaptai lake bed. Segun, is also susceptible to diseases and insects frequently. The rampant monoculture plantation that ensued in the forests in the hilly areas have had manifold negative impacts. Apart from the destruction of the numerous native species and the towering garjan that was once synonymous with these forests, the lives of the indigenous people who have been living in the slopes of the hills for years have been greatly upset. They have not only lost their habitat but the land where they used to do jhum cultivation. In the past, the adivasi people enjoyed inherent rights on the sloppy land of the hills, for generations. Thus it never occurred to them that they had to establish their ownership of the piece of land they have inherited from their forefathers. So, when the aggression of man-made plantation evicted them from their dwelling place as well as land where they cultivated, they had no means to save them. 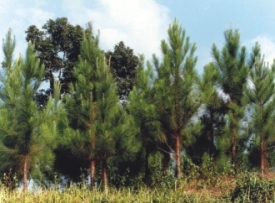 other exotic species that we see on public forestland in Bangladesh are "simple plantation forestry" that requires clear felling of our native forests. This "simple plantation forestry" is said to "return wood yields many times greater than most natural forest systems". 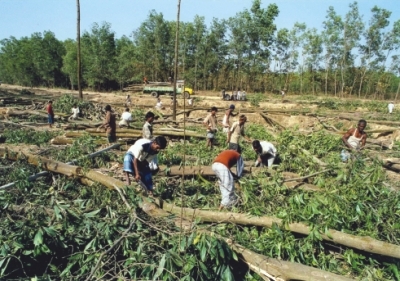 In a number of countries including Bangladesh and India, the so-called "degraded" and "less productive" forestland were targeted for plantations. 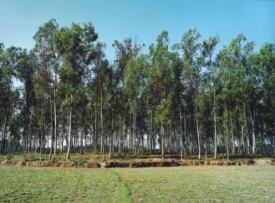 The Bangladesh government in its "Revised Working Plan for the Forests of Chittagong Division for the years 1978-79 to 87-88", adopted monoculture, for what it said "to replace the existing irregular, depleted and less productive forests by a man-made plantation forest with more valuable and productive species suited to the soil and country's requirements". This practice of monoculture that has devastated Bangladesh's forestlands is not just a thoughtless policy the government mistakenly undertook, but to a large extent a deliberate act engineered by a nexus of interested groups including the international financial institutions, local and international pulp and paper industries and the government. 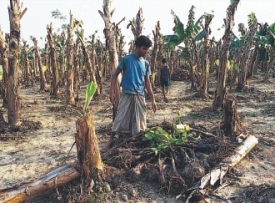 In Bangladesh the destruction of natural forests and practice of monoculture has been conducted under very misleading names such as "social forestry", "participatory" or "community forestry". towards the forests, jhum cultivation, reckless and illegal felling of trees by both the forest robbers and adivasi people living in the forests and mismanagement of the forests. The reality is, of course, different. In fact, it is the same international interest groups like the ADB and World Bank who have widely circulated their argument that the invasive and exotic conifers and eucalyptus are much more productive than the native species, thus justifying the destruction of the natural forests. Rich countries, says Gain, through the international monetary agencies like WB and ADB have long been contributing to the destruction of the natural forest lands of many Asian countries including Bangladesh to serve their own interests. The USA, Japan and the various European countries are the principal importers of wood from the tropical countries. These countries, moreover, consume a huge amount of papers, which they again import from these countries. Therefore, to keep their requisite volume of wood and paper import intact the so-called development projects are promoted. Governments of the countries, meanwhile, push forward and implement those controversial projects in exchange of hefty bribes adds Gain. "These monetary institutions have also been providing soft loans to the targeted countries. All we have in the name of "social forestry", "participatory" or "community forestry" are nothing but their means to serving their own interests", says Gain. Gain further states that these international monetary organisations are always on the look out for countries to invest money and provide technology, which is often outdated and of low quality. Often foreign consultants and companies are employed, thus eating out a large chunk of that loan. It is just another technique of keeping the poor countries entangled in the loan net perennially. On the one hand we have lost our natural forests and our environment has been severely damaged while on the other hand we have incurred the huge burden of loans that will have to be borne by many generations to come. It is difficult to give any precise estimation, but according to Forestry Master Plan, the forest cover in Bangladesh at present is about 769,000 hectres, that is just six percent of the total area. Again, the planted forests are also included in this estimation, but there is enough scope for debate if the planted forests can be called forests at all. Because these types of planted forests usually have a very short duration and after around 10 years of their planting, they are felled. That means the real forest area is less than even six percent, whereas ideally a country should have at least 25 percent forest cover. "Man can plant trees but can never create a forest" is the key massage transmitted in the film. The man-made planted forests comprising alien species are not forest at all as they are being felled after a certain period for commercial purposes. So, they can never substitute the natural forest. According to the film's creator, the government is apparantly changing its mind in discarding its plantation policy, but until now there is no reflection of such a decision in our disappearing natural forests. The Garos in Modhupur who have been greatly victimised by woodlot and rubber cultivation are in dire straits. "We are the children of the forest. We were born here, grew up here and want to die here. Our lives are so intricately associated with the forest that if we are evicted from here we will die," Paresh Chandra Mri, the chief of Garos in Modhupur, says in Gain's documentary. Paresh is not demanding much.